Deliciously thick oatmeal chocolate bars with a hint of pumpkin in the middle — thanks to pumpkin pie spice and pumpkin flavored marshmallows. These bars are easy to make and very rich! Pumpkin and oats were meant to be together. 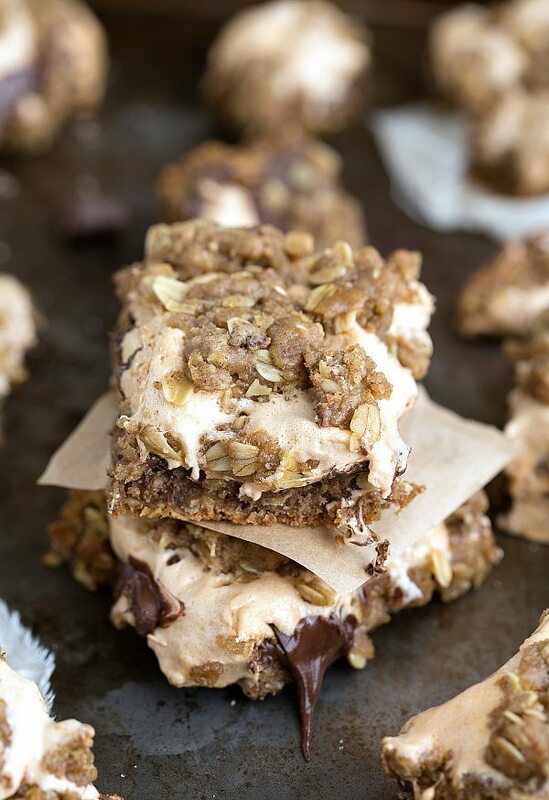 My favorite Fall cookies are pumpkin oatmeal chocolate-chip and these bars are basically those cookies in a gloriously gooey marshmallow form. 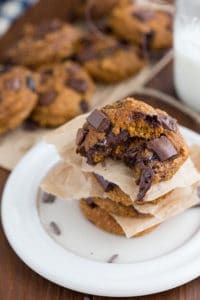 Who’s with me on pumpkin oatmeal cookies?! P.S. Do you like how I specify they are my favorite “Fall cookies”? Because obvi I can’t just have one favorite cookie. As a self-proclaimed cookie connoisseur I have to have a favorite cookie for every season and/or holiday. Like these ones for Christmas…nothing compares. And there I go talking about Christmas again when I said I was going to wait. I’m such a freak about holidays!! Second P.S. the hubs and I went shopping and found the cutest wood pumpkin decoration. It’s currently sitting on top of our mantel place and making me all sorts of happy and excited for Halloween. The good news is, it’s not only a Halloween pumpkin, so it gets to stay up through Thanksgiving. And along with that shopping trip, we also found little Grey’s Halloween costume. He’s a lobster if you missed the picture of him. Bahaha — he is the cutest lobster ever!! What is it and babies in Halloween costumes? I’m totally a crazy person on Pinterest looking at all the baby Halloween costumes all the time. Even before I had a baby. And errr. Even before I was married. Because babies dressed up like fat pumpkins, or popcorn, or LOBSTERS are my favorite kinds of things to look at. And now that I have a baby, the crazy can’t be controlled. So the poor baby has to be in a Halloween costume like every other day because I can’t stop dressing him up in it and then squealing like I’m 15. Please tell me I’m not the only mom that squeals at cute baby clothes particularly lobster Halloween costumes. And enough about Halloween and adorable costumes because you are here for the food and probably not the crazy that is me around Halloween. Or all the holidays for that matter. These bars are SO easy. Only one mixing bowl to make these and then the pan to bake them in. (Which if you line the pan it takes about .5 seconds to wash.) These bars are a must make for pumpkin season. 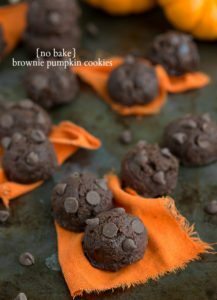 Even though these technically don’t have any pumpkin in them, they are still very much a pumpkin recipe. I used pumpkin spice mallows (my favorite marshmallows EVER!) and then some seasonings in the crust to make them taste all pumpkin-y. You can definitely increase or decrease the seasonings depending on your love for pumpkin flavors. More cinnamon + pumpkin pie spice if desired and less if not desired. If you omit both the cinnamon and pumpkin pie spice, these taste more like oatmeal s’mores bars, but they still have a slight pumpkin hint from the marshmallows. Also, these are RICH. So be warned. If you want these to be a little less rich, just cut down the chocolate to either 1/2 cup or 3/4 cup. I love the thick chocolate layer, but it definitely makes these over the top rich! While I get back to Pinterest searching for babies in Halloween costumes, you’d better get to making these. You’re going to love them!! Preheat the oven to 350 degrees F. Line an 8 x 8 baking pan with parchment paper and set aside. In a large bowl, beat together the flour, brown sugar, baking soda, cinnamon, pumpkin pie spice, salt, vanilla and butter. Beat until well combined and then stir in the oats. The mixture should be crumbly, but also be able to pack together well. If it is too wet, add a bit more flour, and if it is too dry, add a tablespoon or more of butter. Separate this crust mixture in two and press 1/2 of the mixture into the prepared baking pan. Bake for 12-14 minutes and then remove. Immediately pour over the chocolate chips and spread evenly on top of the crust. Crumble the remaining crust mixture on top and bake for another 5 minutes. Even though the top may still appear a bit gooey, don't bake for longer or the marshmallows will get gross. Cut these bars with a knife that is slightly wet. Sounds like your son will make the cutest lobster, Chelsea! 🙂 And I agree, pumpkin and oats were meant to be together! 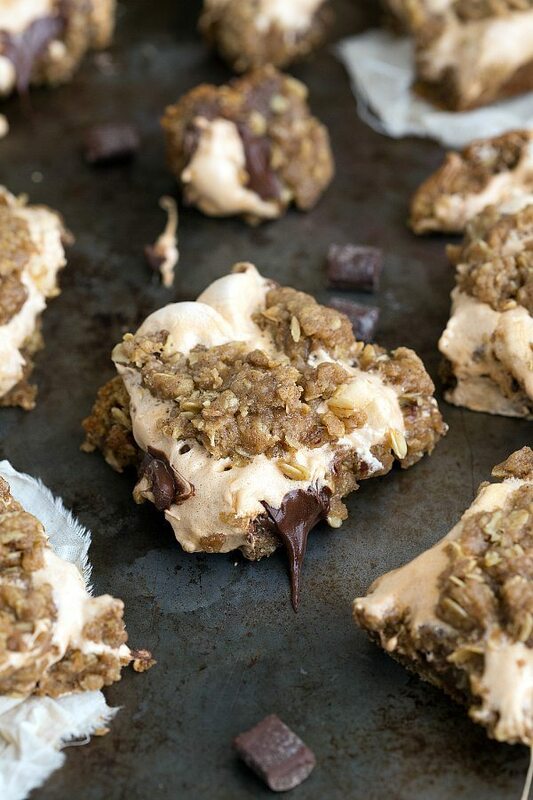 I love that you mashed up this dessert and made it into a cookie and gooey bar. These look amazing, Chelsea! Pinned! Pass me that pan! Pumpkin marshmallows? Too cute!! Pinned! These bars look so fantastic! I am obsessed with s’mores, so I love that you made this incredible-looking fall version! I’m really wanting to make something with those pumpkin marshmallow now. 🙂 Pinned! These are genius! I love the idea of a pumpkin flavored ‘smore. These are the perfect Fall snack! Yum!! These are like everything in a pan. I can’t wait to try this recipe. YUM! Pinned! Mmmm pumpkin marshmallows. I’m still trying to decide what to make with the candy corn marshmallows I bought. The bad thing about living in Canada (beside dealing with 6 months of winter), is having a hard time finding certain things… like pumpkin spice marshmallows (!!!!). 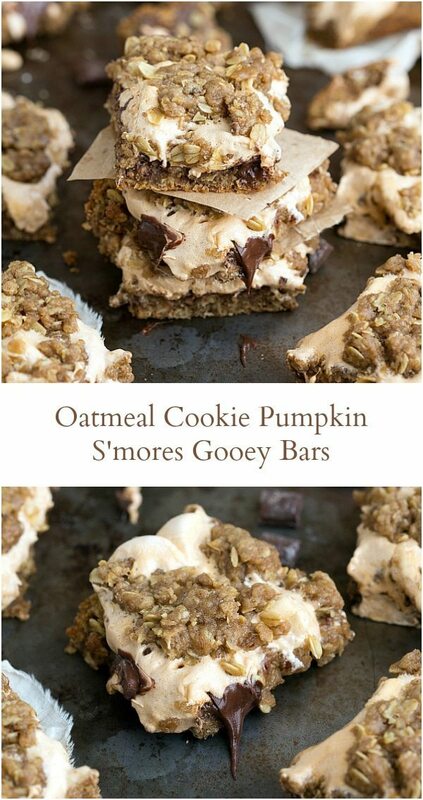 I’m seriously loving the idea of pumpkin s’mores, though! And no shame in being a little holiday crazy or cute costume obsessed — I’m always squealing when I see cute little clothes in the store… and I don’t even have kids! WHY do I never make bars of any kind??! Yours always look so good girly! Awww, cutest lobster ever!! These bars look amazing! I love that crumble on top and the marshmallows and the chocolate, gimme, gimme, gimme!! Pinned! these are definitely gooey, but I love gooey. So it works for me. These bars! So gooey! And all those oats! They look awesome! And I love the lobster costume – one of my old co-workers dressed her baby up as a lobster one year and it was the cutest thing ever! Oh my gosh — we tried to put our little chihuahua in a lobster costume one time… And she just grabbed it in her mouth and swung it around like it was a toy. Whoops! 😉 Love these gooey bars!! I had no idea they made pumpkin marshmallows. Must find. Now. Pinned! Oh, my goodness, these look amazing. Pumpkin flavoured marshmallows? Incredible! 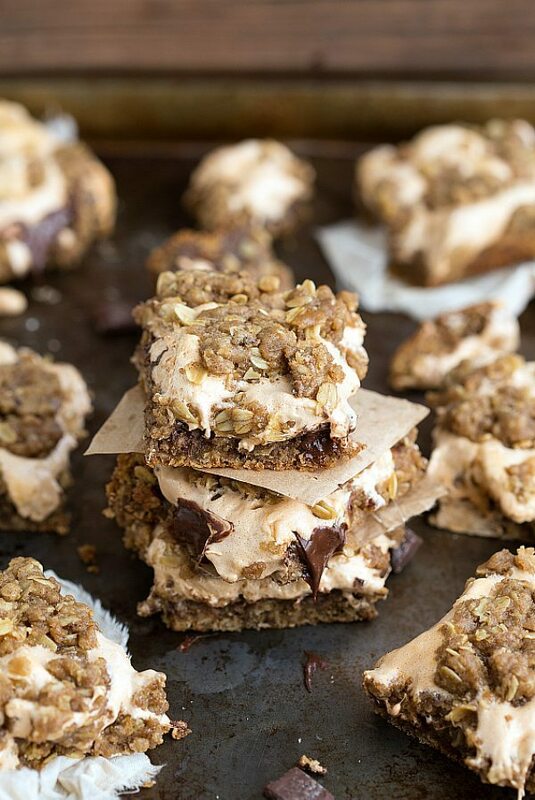 These bars look ooey gooey and delicious! I didn’t know they made pumpkin spice mallows! What a great idea. And I love aaanything with gooey in the title! Chelsea – I swear, you make the best looking desserts. I come here, I drool, I get hungry, then I PIN! Stop right now!! I need these in my life ASAP!!! I’m drooling just looking at your pictures! Gorgeous, Chelsea! To come out of being sick and this is the first thing I see is a sight for sore eyes! These bars look phenomenal Chelsea. 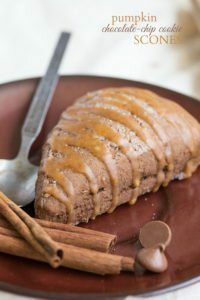 I love the gooeyness and I am completely in love with all things pumpkin and oats too! Love everything about these bars! They look amazing! Hi Chelsea, I dont like pumpkin, what kind I can use instead of pumpkin spice? I love your recepies!!!!! Thank you! You are so sweet! Thank you Diana! 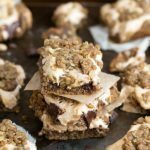 You can completely leave it out and these will still be super delicious and decadent (they’ll taste like a regular s’mores bar)! They just won’t have much of a hint of pumpkin and especially if you don’t end up using the pumpkin marshmallows 🙂 Hope that helps! I live in smalllll town in Canada and cannot find pumpkin flavoured mallows anywhere..what can I do?? Regular marshmallows will work they just won’t be very pumpkin flavored. You could add some more pumpkin spice to the base too if desired.